← The Most You Can Lose? 5 Responses to What Goes Up Must Come Down? All I know is that I made $20k on my retirement investments last year which is a lot to me (I had 70k saved, now I have 90k). I just keep hearing to stay the course no matter what because over the long term (50 year working life) you will be ok by investing in the stock market. I have 20-25 more years to go until retirement. Hillary: that advice is generally correct – over the long haul, buy-and-hold leads to better results than trying to time the market. I can recommend “A Random Walk Down Wall Street” as an easy read if you’d like to learn more. The challenge is not selling after a big market crash, which most individuals (but not companies) did in 2008. If there is a big market downturn in your future, you’ll be tempted to sell to avoid further loss. But that means you’re selling at what might be near the bottom of the market. As long as you still have 10+ years from needing the money, most advisers recommend staying the course. For *really* bad years, it looks like there’s some historical evidence for them being followed by really good years (more than without that conditioning). 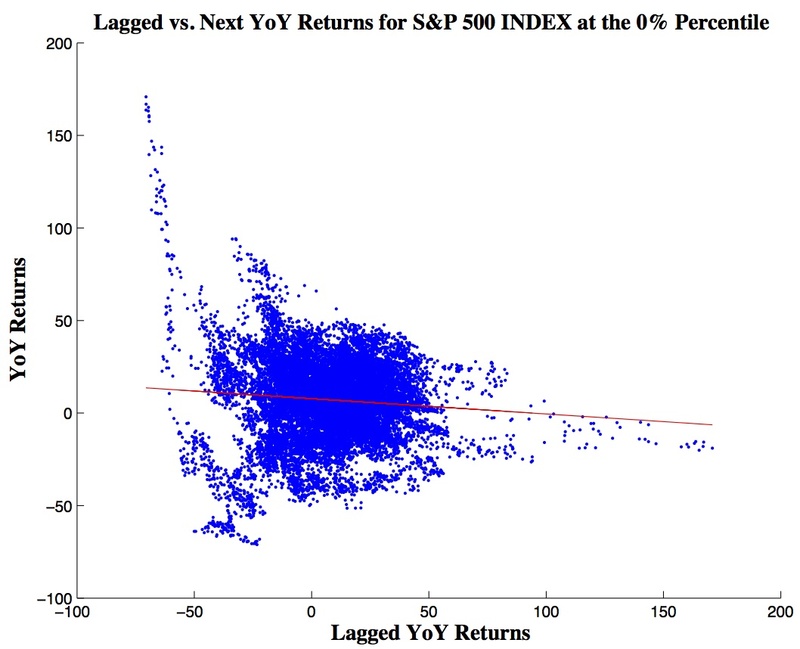 Notice that *all* years with greater than 100% YoY returns follow really bad years. Yes – we point that out in the paper too. You have to be careful because those ‘years’ are actually one event that have overlapping 252-day windows. Since these are rolling returns one ‘event’ can produce data points that would otherwise be interpreted as independent. But the point is valid: really bad years are followed by a rally.